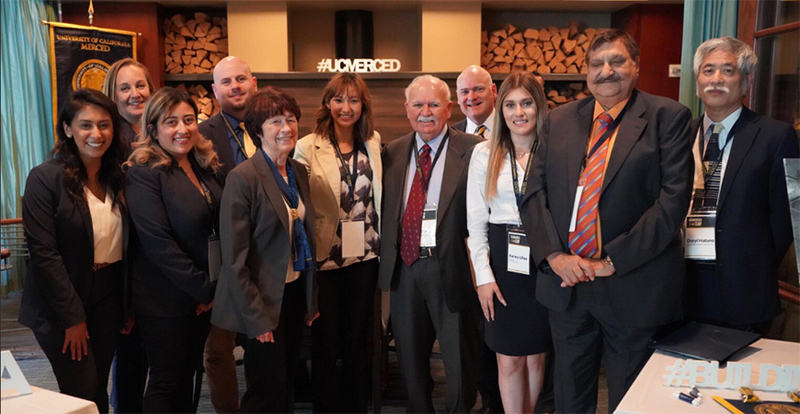 Chancellor Dorothy Leland was joined by UC Merced students, staff, alumni and trustees at the second annual UC Merced Day in Sacramento. Just days after visiting the nation’s capital, Chancellor Dorothy Leland trekked to the state capital to advocate for the campus and the UC system as part of UC Merced Day. In the second annual UC Merced Day in Sacramento, the chancellor was joined by students, alumni and members of the university’s Foundation Board of Trustees, who met with legislators at the Capitol to discuss the importance of Summer Cal Grants, the UC system’s budget request and the need for a higher education bond. The group also emphasized the importance of UC Merced to the landscape of higher education in California. Though the campus is proudly located in the heart of the San Joaquin Valley, UC Merced has students from all across the state, with high concentrations in the San Francisco Bay Area, and greater Los Angeles and Sacramento regions. Seniors Berenice Ballinas and Karina Ulloa and first-year student Gabriella Gustafsson joined the chancellor in Sacramento. A Santa Ana native, Ballinas currently serves as a field representative with Assembly Member Adam Gray’s office. The political science major previously served as legislative director for the Associated Students of UC Merced. Ulloa works as a student employee in the Division of External Relations. The political science major from San Fernando Valley is also involved with the Campus Activities Board and Recreation and Athletics. Biological Sciences major Gustafsson is a member of the women’s cross-country team and is from Oakland. From left: Domonique Jones ('16), Lande Ajose, senior higher education policy advisor to Governor Gavin Newsom, Chancellor Leland and UC Merced Chief of Staff for External Relations Danielle Armedilla ('12). Alumni who took part in UC Merced Day activities included: Keith Ellis (’12), Aaron Hill (’09), Marko Zivanovic (’14), Domonique Jones (’16), Danielle Dawang (’14), Brooklynn Pham (’09), Michelle Teran (’11), Taylor Woolfork (’11), Ulises Vargas (’18), Stephanie Brausch (’13), DeVaughn Ogles (’17), Matt Wainwright (’13) and Daniel Martinez-Peralta (’12). During her time at the Capitol, Chancellor Leland met with Tony Thurmond, state superintendent of public instruction, to discuss increasing college-going rates in underserved areas. Leland also met with Lande Ajose, the senior higher education policy advisor to Governor Gavin Newsom. 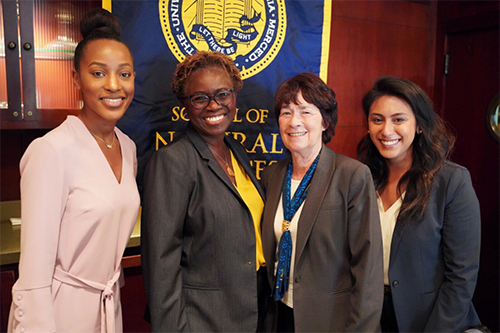 Ajose also served as special guest speaker at the UC Merced Day luncheon, where she discussed triumphs, challenges, and the future of higher education in California under Gov. Newsom. Chancellor Leland and the UC Merced Day delegation also met with State Senators Andreas Borgeas (R-Fresno), Steven Bradford (D-Gardena), Anna Caballero (D-Merced); Senate Majority Leader Bob Hertzberg (D-Van Nuys); Assembly Members Adam Gray (D-Merced), Ash Kalra (D-Palo Alto), Kevin McCarty (D-Sacramento), Rudy Salas (D-Bakersfield); and the Jose Medina (D-Riverside) and Steven Choi (R-Irvine), chair and vice chair of the Assembly Committee on Higher Education, respectively. Last week, Chancellor Leland was in Washington, D.C. to advocate for Dreamers as part of the first convening of the Presidents’ Alliance on Higher Education and Immigration.